Successfully Added Fingerprint + Access Code Door Lock (Gold Edition) to your Shopping Cart. Double action fingerprint and access code security door lock for your home, office or small business. Get modern biometric security at your entry point with this standard door handle style double action doorlock. This is the most secure and convenient method in assuring only authorized people can access private rooms in your house or office. Anyone needing access to a room having the CVKJ-J15 installed on the door will have to place their finger on the fingerprint sensor and/or punch in a passcode to unlock the door. The beauty of this fingerprint door lock lies in both the security and ease-of-use it provides. This fingerprint door lock allows for simple keyless entry via fingerprint ID or PIN code for authorized personnel while preventing unauthorized room access for everyone else. What you get with this fingerprint door lock is complete peace of mind with a guarantee of 21st century security, meaning this lock cannot be picked or bypassed. If someone is not authorized for access to a room or building, then they will never be able to gain entry. With its advanced 3D sensor pad with sliding coverhatch, the CVKJ-J15 can handle all weather conditions, any light condition, and can never be fooled by fake fingerprints (like molds or photo reproductions). Making this model the perfect entry security system for all your important home or small office doors - period! When it comes to quality this unit can't be beat. A perfect example of no compromise Swedish engineering technology coupled with excellence in Taiwan design. The main quality advantage of this model is its use of 3-D optical sensors rather than a typical 2-D digital sensor, as well as the use of an advanced surface coating to keep the swipe detection area "machine readable" even after thousands of greasy finger swipes. This superior technology ensures consistent long term stability and unbeatable security, making unauthorized access to a room impossible while allowing this model to run maintenance-free. 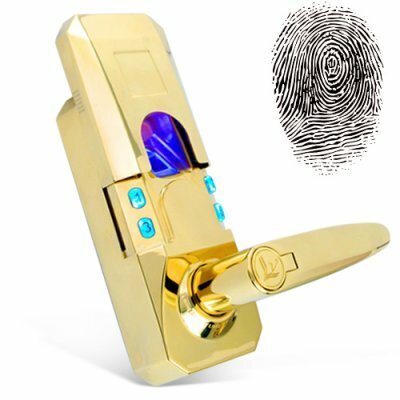 In addition to total security, convenience and dependability, this superb fingerprint ID entry system comes in a classic gold finish and will compliment most home and classic office decor. With an unbeatable factory direct wholesale price, you are getting a high specification security fingerprint door entry lock that just cannot be found anywhere else at this price! Order yours today and we will ship it out of our warehouse tomorrow! Included in the installation kit are a set of 2 mechanical keys which can also be used to unlock the door. These are normally kept by the building owner in case of emergencies. Carefully read the manual before installing and operating this product in order to achieve the most satisfying user experience. Fingerprint ID is the ultimate in convenience. No more rummaging through your purse or pockets for your keys, no more changing of the locks after suspicious activity from house workers, no more hiding keys under rocks or flowerpots. All you need to do is slide the protective cover up and place your finger on the sensor for authorized access to a room. It doesn't get any easier than this. Why is the number pad labeled 1 2 3 8 and not 1 2 3 4? In some Asian countries the number 8 is considered lucky, while 4 is unlucky. So we have given you a very lucky keypad (especially good if this door is located on your bedroom door!). The door of my master bedroom is installed with a tubular lock. Can I change it to the CVKJ-J15 fingerprint lock without any hassle? Yes, you can do direct replacement of tubular lock with CVKJ-J15 fingerprint lock. The installation is quite simple with just a screwdriver. Does the CVKJ-J15 fingerprint lock have a low battery alert? Yes. When you slide the cover up and hear a triple BiBiBi sound instead of the normal one Bi sound, then the battery is low. You can still operate the unit about 100 times. However, change the batteries immediately when there is low battery alert because once the battery dies you can only open the door with the keys (and there are only two). This is very important if you own a business, because you do not want to lock out your employees. No, the unit is weatherproof but not waterproof. Meaning any outside door that is in a well covered area where there will be no direct rain or snow contact is acceptable, but the unit can never be directly exposed to constant water contact. Can the CVKJ-J15 fingerprint door lock sense fake fingers? Yes. Individual sensor elements of the 3D CMOS sensor can sense both the tactile surface and skin charge from the finger to get a 3D image of the fingerprint. It will reject fakes such as photocopies, pictures, wax coatings, fake fingers, and even dead fingers cannot fool the 3D sensor! We have some sensitive employees, they are worried about a machine storing their fingerprints. What can I tell them? This model stores the fingerprint data in a military-grade encoded file type that is only readable by this machine. In addition, the fingerprints are stored as data and not as images. What’s the difference between a fingerprint lock and traditional tubular lock? Why should I change to a fingerprint lock? A fingerprint lock brings keyless convenience to your daily life. Your finger is the key, so it is always with you! The CVKJ-J15 with advanced performance features brings a user-friendly entry interface to your daily life. How can I access the keyhole when there is cover over it? By using the tip of your thumb you can push open the cover, then use your other hand to pull up the cover and keep it fully open while you insert the key.